← How to convert the 4th page of pdf to wmf? How to make use of effective compression processing to minimize space occupied by the created PDF files? When transferring image files with large size, it takes a lot of time to upload and sometimes difficult to open or save. That is why the files are compressed and sent in different formats. Take TIFF for example, it is the best format for handling images and data in a single file meanwhile it can store high quality images. Then how can we keep the exact reconstruction of the original image and maintain quality then make the file in less size. Then we can make the image transferring simple and accurate. If you have not found a better way, please have a try of this software- Image2PDF v3.2 which can makes use of effective compression processing to minimize space occupied by the created PDF files; for example, an A4 paper size TIFF file with a B/W image the output size is about 40KB to 50KB per page; color and gray-scale images are also compressed and optimized. Please see the detail operations as follows. Add your uncompressed file to it. Add your file by clicking “File” then to “Add file” option. I will take a tiff file for example. The size of this file is 1052kb. Clicking “Make PDF” to finish the converting. 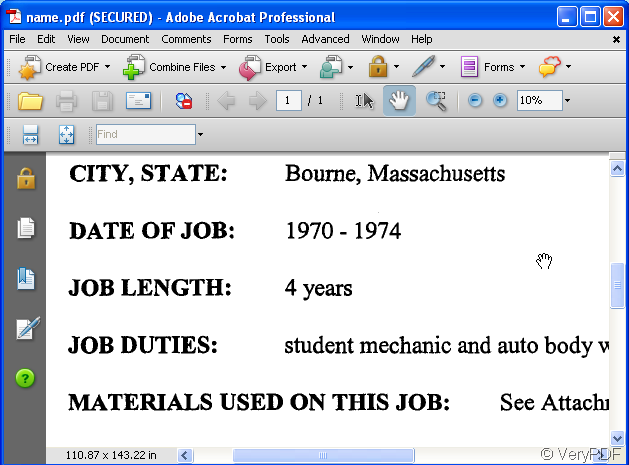 When you click “Make PDF”, it will bounce a new dialog box like the following picture. 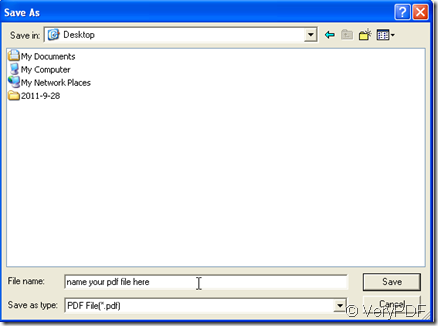 Please choose the folder and disk to save this PDF file and name the new file. It takes one second to finish the converting. 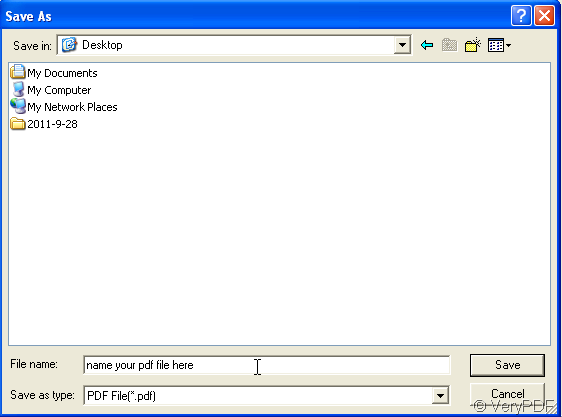 Your PDF file will be shown in your appointed folder. The example has already on the desktop. 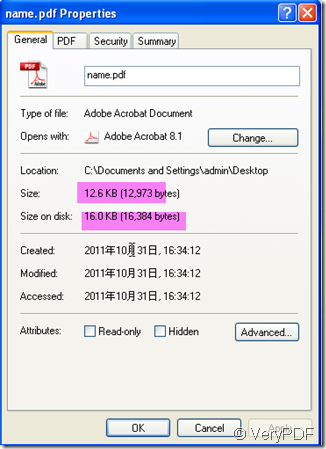 The converted file size is12.6KB. After converting, the picture seems more clearly than before one but size is super small compared with the source file. 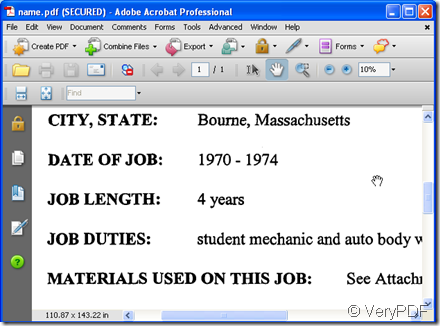 How to print password protected PDF to paper document directly? 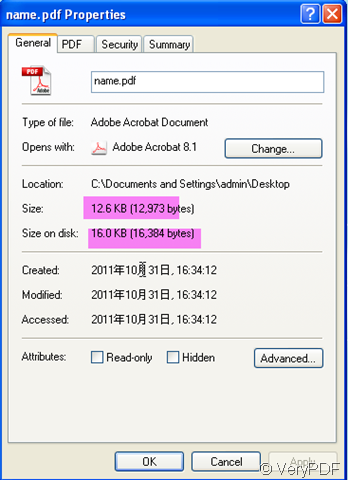 How to shrink the file size of a PDF for emailing? How to convert rtf to wmf in a command line? How to convert Files extension like txt / doc/xls / ppt / html to TIFF format? How to fill job application form easily? How to view PCL online free? How to print Word to tif? How to add author for your image file by command line? How to insert image to PDF? 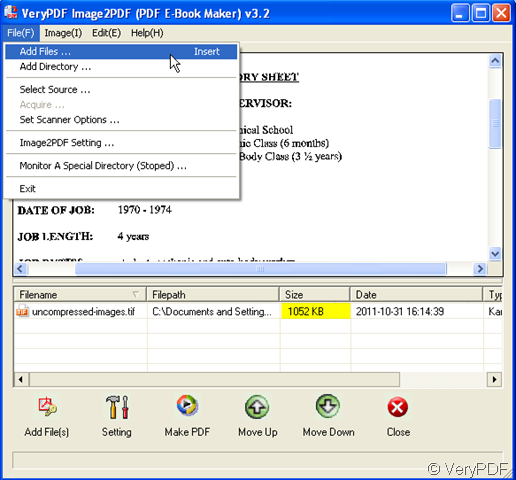 Stitching together image files & Extracting Pages from PDF docs? How to set color depth when convert EMF to JP2?